In stock -This product will ship today if ordered within the next 10 hours and 12 minutes. Coconut oil is a light, non-greasy oil that is easily absorbed. It has softening, soothing and nourishing properties making it ideal for skin, hair and body care. Coconut oil will become solid at room temperature. Coconut light pure oil is a fractionated coconut oil which makes the oil thinner (even at cooler temperatures), odourless and much easier to use as a carrier oil, for massage and for making body care products with. It also increases the stability of the oil and gives it a much longer shelf life. Amour Natural is a specialist supplier of high quality, therapeutic products for aromatherapy and body care. They offer a range of essential oils, carrier oils, specialist oils, butters, waters and other aromatherapy and body care products suitable for use by therapists, enthusiasts and beginners. Warm gently and apply directly on the skin or hair to condition and repair. Mix with other oils for a massage blend. Can be used as an ingredient to make your own hair, body and face care products. Keep away from children and eyes. 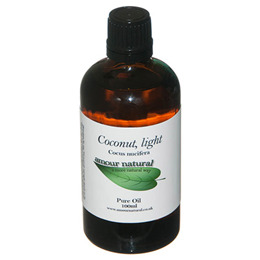 Below are reviews of Amour Natural Coconut Light Pure Oil - 100ml by bodykind customers. If you have tried this product we'd love to hear what you think so please leave a review.